NYO also recruits young musicians to join us on our residencies playing orchestral keyboard parts. The Orchestral Keyboard section is repertoire dependant, and varies from year to year. This is an exciting opportunity for young pianists (between the ages of 13-19) to develop your piano playing in an orchestral direction. 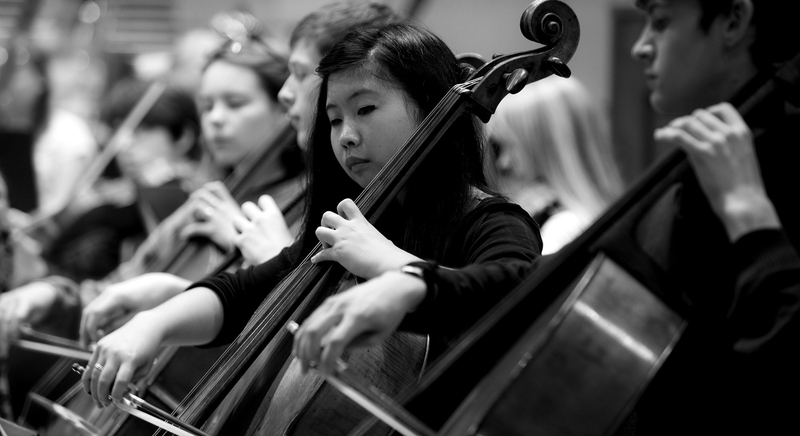 We provide world class tutoring and playing in large scale orchestral repertoire in major concert halls across the UK. Pianists work alongside other talented and like-minded young musicians and with first-rate artists at a national level. We are looking for a small pool of 2-4 musicians who will join as the NYO Orchestral Keyboard section. We allocate residencies and projects between the section as the repertoire dictates. Keyboard parts cover orchestral piano, celeste and occasionally organ parts. We sometimes audition separately for organ parts dependant on repertoire. If you are only interested in opportunities for organ, please enquire separately by emailing auditions@nyo.org.uk. Most residencies require two musicians for the section, but sometimes we may ask more to attend (or occasionally we just have one). Detailed information about applying for NYO and the audition process can be found in the links below. The audition panel will consist of an NYO Keyboard Tutor and a member of the NYO management team. Sometimes additional members of NYO staff will join the panel. You will be introduced to everyone on the panel when you go in to your audition. They are friendly, welcoming and approachable and want you to have a positive experience with us. In the first part of your NYO audition you will play a piece of your own choice for the panel. You will be asked to play for around three minutes in total. You can choose an excerpt from a longer piece, but please bear the time limit in mind, otherwise you may be asked to stop before the end of your performance. Always choose a work you know well and enjoy playing, as this will help you perform at your best. Please bring a copy of your piece for the panel. Have a look at our website here for tips on how to choose and prepare your pieces. The excerpts are a central and vital part of your audition. We recommend you prepare very well indeed and look at them well in advance of your audition. Excerpts are chosen so that you can demonstrate your understanding of orchestral musicianship in demanding repertoire and in a musical context. They enable the audition panel to establish how players of differing standards address the technical and musical challenges in the same repertoire. Please pay very careful and thorough attention to all of the musical details of the excerpts (including tempo and markings). Excerpts are available here. Please prepare all excerpts. This is to assess how you respond to music that doesn't have the advantage of being fully prepared. It gives the panel a clear indication of your musical strengths and areas of improvement and also how you might approach a rehearsal when we are working on a new commission. We might also ask you to play some simple sight reading in a duet with our NYO Tutor to get an idea of how you might approach an ensemble context. NYO auditions is the perfect moment for us to get to know you better in person, so we ask you for a quick chat after hearing you play. We want to find out a bit about what you think you’ll bring to NYO and what you hope to gain from being in the orchestra. We might ask you about some things which you have written about in your application form. You might want to think about what we may expect of you as musicians and role models at NYO. It is a good opportunity for you to ask us any questions you have about us, too. We may also take this moment to talk about progress in your playing and give you any advice after hearing you play.